The Development Center for Maintenance of Composites (DCMC) will enter a new phase with the approval of OPZuid financing for the establishment of a Fieldlab in Woensdrecht, The Netherlands. At the Aviolanda Business Club meeting, Vice Governor of the province of Noord-Brabant Bert Pauli presented the granting of the subsidy to the founding fathers Fokker, NLR, Airborne and TU-Delft. The DCMC initiates and supports innovations in Maintenance, Repair and Overhaul of composite (aero)structures. In march 2016 the DCMC was officially launched and soon followed by an application within the OPZuid subsidy, a European Innovation program for the South Netherlands. This program is financed by the European Regional Development Fund, the Dutch government and the provinces of Noord-Brabant, Zeeland and Limburg. After extensive evaluation by an independent board, the DCMC proposal was ranked number one and was rewarded a total of 2.8 million Euro subsidy for innovation and research. Mr. Bert Pauli presented the subsidy award at the Aviolanda Business Club meeting, witnessed by representatives of government, research institutes and industry. The Development Centre for Maintenance of Composites focusses on the development of new maintenance repair technology and overhaul products, processes and services for composite (aero) structures. By bringing together knowledge, capabilities and infrastructure a bridge is created between fundamental research performed at institutes and applied technology developed by companies. Projects managed or performed by the DCMC are assessed and performed on case-by-case in close cooperation with customers and have a Technology Readiness Level (TRL) between 4 to 6/7. The OPZuid financing will enable the establishment of a test, development and training centre in the form of a Field Lab at Business Parc Aviolanda, adjacent to the Royal Netherlands Air Force base Woensdrecht. In this new Fieldlab, businesses and knowledge-based institutions will collaborate in innovative programmes encompassing (among other things) automated repair of composites and advanced inspection techniques. The ambition of the DCMC is to become an international leading and independent authority which initiates and supports innovations in the field of Maintenance Repair and Overhaul of composite structures. This is done by guiding different (inter)national innovation projects and execution of research and development programmes initiated by DCMC members. The cluster will provide an impulse towards job creation in the region West-Brabant and the consolidation of Woensdrecht as an international maintenance centre for aerospace in Europe. Vice Governor of the Province of Noord-Brabant, Bert Pauli: ‘The defence industry, the business community and knowledge institutions in West-Brabant have been sharing maintenance knowledge and skills for a few years now. Supported by local and regional government, this has provided a major stimulus for commercial activity and innovation in the field. The knowledge centre for composite maintenance is a great addition. It makes the region even more appealing to potential partners and businesses looking to relocate here from the Netherlands and abroad’. The DCMC organisation will be a collaboration between first and second tier companies, OEMs and knowledge institutes, both from The Netherlands and abroad. Initially the centre will focus on the aerospace market, but during the implementation spin-offs and spill-over into other markets will occur. 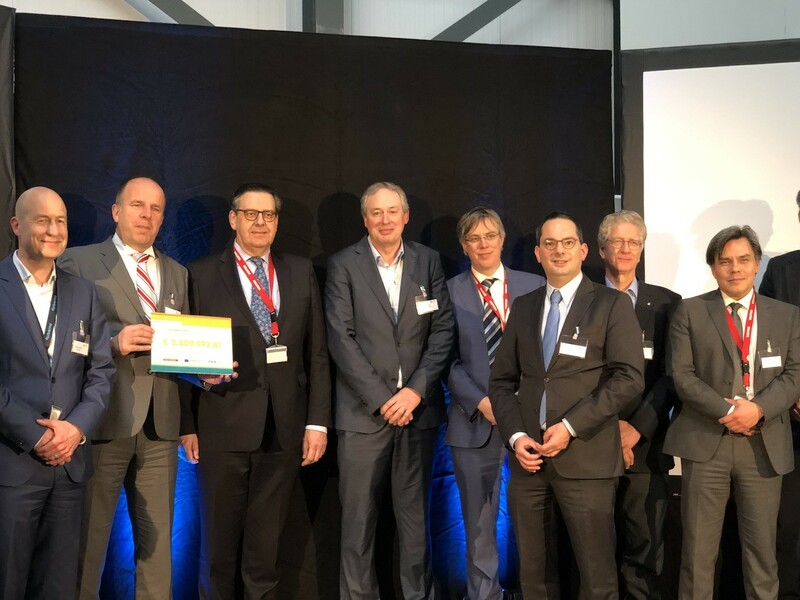 The partners the DCMC are founding fathers Fokker, NLR, Airborne and TU-Delft supported by Tiat Europe, Damen Shipbuilding, BOM, Dutch Terahertz Inspection Service and REWIN West-Brabant. Fokker Services: this is an integrated, knowledge-based services organisation that partners with manufacturers, owners and operators of aircraft in the continued competitive operation of their fleet by increasing technical dispatch reliability) and passenger comfort while reducing direct operating cost. Fokker Services BV is a company of the Fokker Technologies Holding. NLR: The Netherlands Aerospace Centre NLR is the central institute for aerospace research in The Netherlands. NLR is an independent non-profit organisation and one of the Dutch Major Technological Institutes that performs a large part of the applied research each within its own specific technology field. Airborne Services: Airborne is a company specialised in the design, manufacturing and maintenance of composite aero-structures. The group employs around 250 people and has facilities in The Netherlands and Spain. The participating business unit is an EASA Part 145 approved and MAA-NLD A-145 accredited maintenance organisation and FAA 14 CFR Part 145 Repair Station. Airborne specialists perform maintenance and repair on composite structures, with a focus on rotor blades of military and civil helicopters. TU-Delft: The faculty of Aerospace Engineering at Delft University of Technology is one of the world’s largest faculties devoted entirely to aerospace engineering. It is the only research and education institute in the Netherlands engaged in research and teaching that is directly related to the aerospace engineering sector. It covers the whole spectrum of aerospace engineering subjects and explores vital related fields such as wind energy. The faculty is home of around 2,500 BSc and MSc students, 214 PhD candidates and 27 professors supported by scientific staff.